Fourth Row Center: Film Writings by Jason Bailey: On DVD: "Brooklyn's Finest"
It’s funny, how shakily Antoine Fuqua’s Brooklyn’s Finest starts, and how confident and sure-handed it becomes over the course of its two and one-quarter hours. In the wind-up, Michael C. Martin’s script seems comprised entirely of stock characters and situations—the short-timer, the cop on the take, the undercover man who’s gone too deep. But as the narrative progresses, Martin and Fuqua intertwine the stories in unexpected ways, and build an overall arc that is greater than the sum of its parts. Richard Gere heads the ensemble as Eddie, an alcoholic wreck of a mediocre beat cop counting down his last seven days on the job. As he runs down the clock, his superiors pair him up with some rookies to show them the ropes, but all he sees are young, naïve idealists who don’t know what they’re doing, nor what they’re in for. Working out of the same Brooklyn precinct is Sal (Ethan Hawke), whose big family is bursting out of his small tract house; in desperation, he finds himself succumbing to the temptation (and rationalizations that follow) of skimming some extra cash on drug busts. Tango (Don Cheadle), meanwhile, has been working deep cover, involved at a high level in the drug-running operation out of the notorious BK Projects. He’s ready to close up shop and get the promotion he’s been promised, but the powers that be want him to first help take down Caz (Wesley Snipes), an OG just out of the joint who has become his friend—and who is trying to stay on the straight and narrow. The opening scene, in which Vincent D’Onofrio delivers a monologue about the varying gradients of right and wrong, is well-written but lands right on the nose; it’s the equivalent of the Shakespearean “prologue,” in which we’re pretty much told exactly what to expect for the rest of the story. As we spend the opening scenes sorting through who everyone is, the picture comes on like grand opera—and Fuqua, though stylistically gifted, can tend to lay it on a little thick (dig the big cross over the basement sink as Hawke washes literal blood from his hands). With so much happening, frequently at top volume, there’s not a lot of room for subtext. Though the scenarios may be familiar, Martin’s script is structurally sound; he’s giving us what amount to three short stories, but it never feels as though we’re channel-surfing, the way weaker multi-story narratives often do. Fuqua’s steamroller direction, aided immeasurably by Marcelo Zarvos’s powerful score and Barbara Tulliver’s graceful editing, fold the stories together smoothly and intelligently. 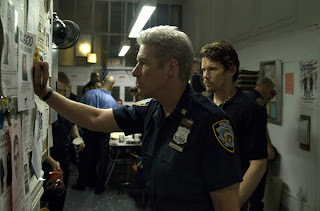 Fuqua deftly intercuts his scenes throughout, stacking multiple set pieces on top of each other—Cheadle, Snipes and their gang confronting a potential snitch on a rooftop, Hawke on a high-energy bust, and Gere on a deli shoplifting call that goes awry—to amp up the tension and weight of the situations. Brooklyn’s Finest builds as it goes, with Fuqua finding clever ways to make the three stories propel each other, to feed of their momentum, right up through the climactic sequence that sends the three cops careening headlong right into each other’s paths. The way he pounds us with violence at the climax makes the subsequent tension borderline unbearable, particularly as he understands, at a key moment, the power of thick, loud silence. Brooklyn’s Finest isn’t always a smooth ride, and sometimes threatens to buckle under the weight of its top-heavy storytelling and overstuffed aspirations (Martin’s screenplay isn’t quite as complex as Fuqua’s ambitious direction wants it to be). But it is indisputably compelling stuff, and at its blunt, brute level, it works on you. "Brooklyn's Finest" hits DVD and Blu-ray on Tuesday, July 6th. For full A/V and bonus feature details, read this review on DVD Talk.